With so many different forms of communication nowadays, announcing a death can be done in lots of different ways. Wherever possible the news should be communicated verbally face to face or on the telephone. Distant relatives and friends should be told by either letter or email. A public announcement of the bereavement and details of the funeral are usually published in a death notice in the local newspaper. This usually contains essential information about the funeral, whether to send flowers, information about charity donations and any other special arrangements. 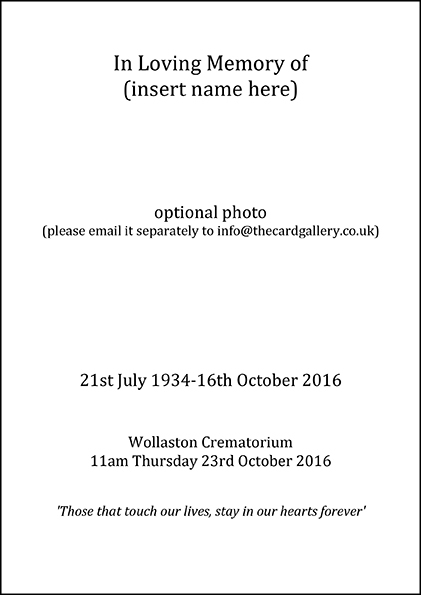 Announcements cards are used for personal death notices. They are sent to family and friends and include essential information about the funeral , whether to send flowers, information about charity donations and any other special arrangements. He was a much loved husband of Mary Brown. Please send all memorial contributions to Compton Hospice. sadly passed away on 6th June, 2017, aged 90. Dearly beloved wife of John Brown, much-loved Mother of Elizabeth and David. No flowers please, alternatively donations to Compton Hospice appreciated. A funeral order of service should contain a step by step guide of the service. A design is usually chosen to reflect the persons age/interests. It is popular to add photos of the deceased to the front, back or inside. 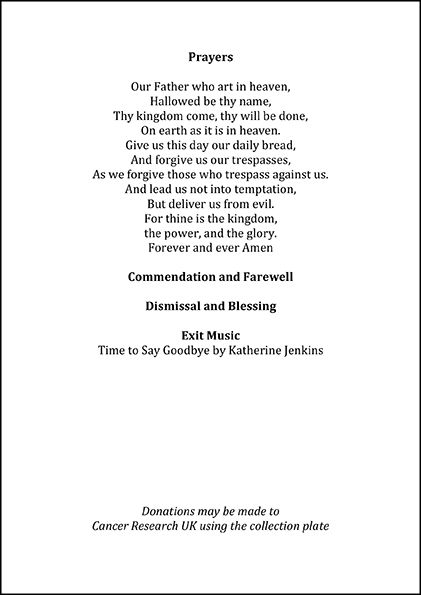 This not only adds a personal touch but it makes a perfect keepsake for family and friends attending the service. 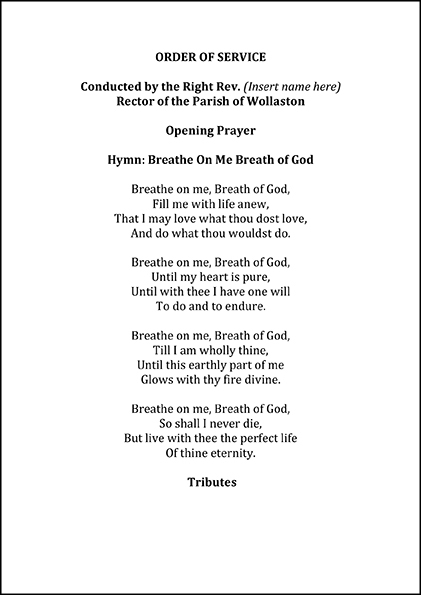 The inside of the order of service should include titles of hymns, songs and readings, as well as the name of the composer or author. You may also want to include the names of the people doing the readings. Before using/reproducing hymns, you need to check with your minister/registrar if they protected under copyright laws. It is illegal to reproduce the words without permission until 70 years after the author or composer's death. 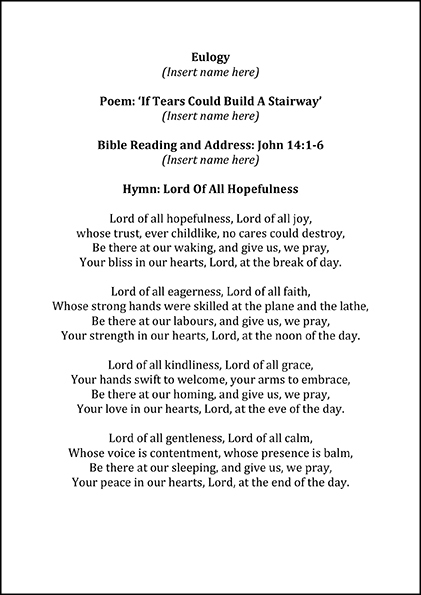 However, most hymns were written so long ago that this will apply to. It is also good practice to credit the minister/registrar, choir, organist and musicians. It is good etiquette to acknowledge the support and kindness that people have offered at this difficult time. Although it is the last thing that you probably feel like doing, sending a short thank you note shows your appreciation of all those that have offered sympathy at this difficult time. Your support was very much appreciated at this difficult time. thank you for sharing your memories, love and support. Your kindness is deeply appreciated and will always be remembered.